I gagged a little at the thought of soap made from placenta, of any creature, let alone human. It reminded me of a chapter in one of the books of my hero, Adrian Mole (yes, I know he's fictional, don't start) in which he describes an incident when his American penfriend advises him to kill a frog and stick it in a blender, and smear the pureed gorey remains on his face in order to cure his spots. 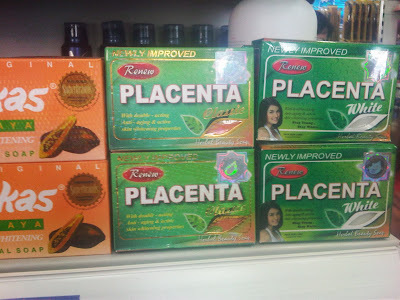 I rushed home to enlist the services of Mr Google, and, mercifully, I discovered that this particular brand of soap, Renew Placenta, is not made from any part of an animal or human's afterbirth, rather, it is herbal. 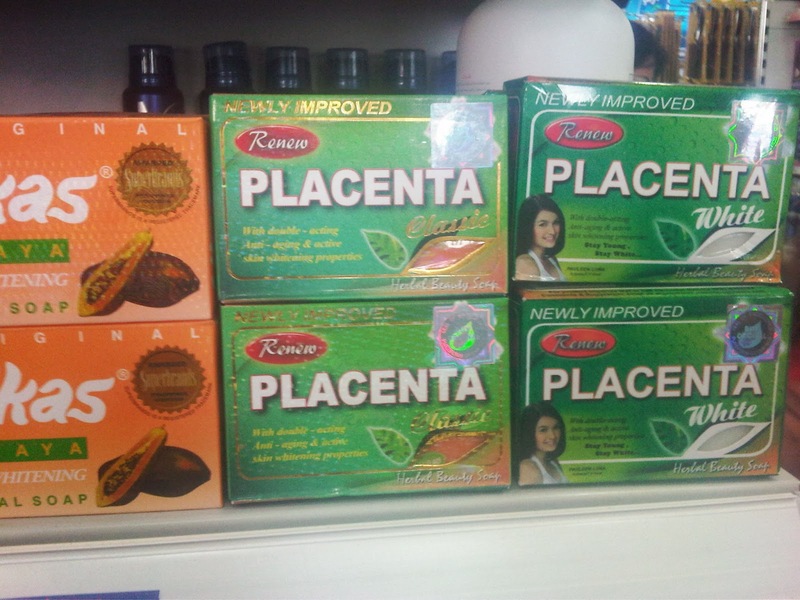 Placenta refers to the placenta of a plant. It didn't half get me thinking about the lengths to which people will go in this part of the world, and, of course, many others, to keep their skin looking white. Meanwhile while their loony European, American and Australian counterparts, apart from the Goths of course, are doing their level best to burn their skin to a brown, crusty carcinogenified crisp at every available opportunity. I went on a press trip to Taiwan when I first moved here, and I remember being staggered that the lady who was showing me round was five or six years older than me, when she looked about 10 years younger. Genetics has a lot to do with youthful appearance, of course, but, having professed such shock at this lady being in her late 30s, I had to do all the: "Goodness me, how do you stay looking so young?" stuff. "It is the damp climate," she professed. Which I suppose could be a point, if you will excuse the slightly "bad science" connection between damp weather and skin being extra moisturised to help it stay looking young. Or, it could be the fact, that, when we were out and about, as soon as the sun even thought about peeking out from behind a cloud, she put up a parasol and cowered under it, lest any of its rays reach her skin. For her trouble, she did indeed have an incredibly youthful, extremely pale complexion. The value of a pale skin to many women of different nationalities is clearly not something to be snidey about, and far be it from me to criticise women who choose to lighten their skin. Women clearly feel pressure to lighten up, and certainly don't feel embarrassed to do so, rather, tanned skin is seen as something to be embarrassed about, as is borne about by Renew Placenta's slogan, which is enough to make your average left wing westerner gasp: "Stay Young, Stay White." A pale skin, after all, demonstrates prosperity, a concept loaded with the symbolism of a time when you showed your wealth in the fact that you did not need to labour or work outside. Instead, you were inside, protecting your delicate visage from the sun's aging effects. On our trip to India, we got used to seeing the product "Fair and Lovely" advertised everywhere, something, we agreed, that may as well be labelled "Rich and White" as that is the image users are hoping to project by using it. It is bizarre, when you think about it, though, this opposing obsession that the two cultures have with light and dark: Us white people risking skin cancer and premature aging to go darker, perhaps for the same reasons our darker counterparts do the opposite, to project the image of health and also, wealth - of being someone who can afford numerous holidays in the sun. Meanwhile people with dark skin take the same risks, skin cancer and premature aging, plus the sinister sounding "skin thinning" and poor wound healing ability, to go lighter. I read earlier this year that one Bollywood actress is taking a stand against skin lightening in films, branding it racist. It will be interesting to see whether others start to take up her cause and her message spreads.